We have a glorious sunroom with windows all around and no curtains or shades. For most of the year we have heavy leaf cover but on the shortest days of the year between 2:30 and 4 PM the sun shines right into the eyes of visiting friends and family. We knew that if Christmas was sunny this would be a problem. We used snowflakes to help mitigate the issue. Daughters Amy and Karen and husband David all helped cut snowflakes as we watched football on the day before Christmas. We taped them to the upper third of the sliders on the southern side of the sunroom. On some panes they were mixed with the three-dimesnional snowflakes made years earlier. Christmas was bright and sunny ( with absolutely no snow!). It wasn't a perfect solution but it helped immensely. 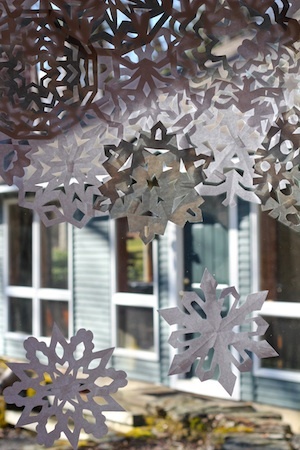 Next year I think I will experiment with frosted icicles made from contact paper. 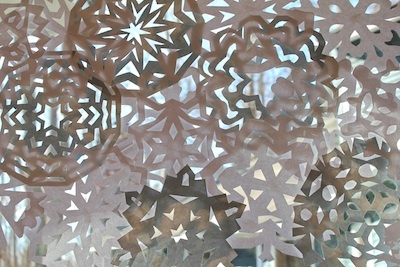 I have been cutting paper snowflakes since I was a kid. 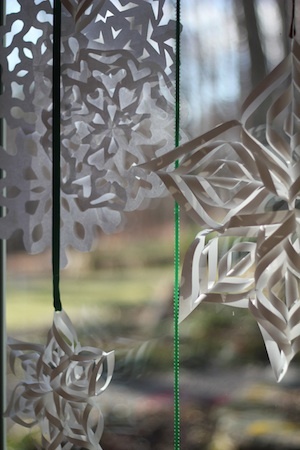 Here is a link to a site with simple snowflake instructions in case you need them!